PS: I am still doing the math on the $40 promotion. More on that tomorrow! Google Play has a 30% off TV season promotion running until the end of day on 12/1/15, and it looks like Amazon doesn’t want to be left behind, they are price-matching this offer. At Amazon Instant Video (offer only good on the website, using a web browser), use coupon code TVSEASON30 to get 30% off select TV seasons. IF you are suffering from smartphone hoarding, this is a very good/bad time, because there are so many specials and so many phones to have and try and compare and such 🙂 One more temptation is in right now, Virgin Mobile’s Cyber Monday offering is the new condition LG G Stylo for $100. No contract. You can only use it on Virgin Mobile (or any other compatible sister MVNO carriers) if you want a cellular plan. But if you only plan to use it as a Wifi device or mooch off your hotspot or other phones, then you can’t go wrong, especially if you like having a stylus. Granted, the stylus is not at the level of the Samsung S-Pen or the Surface Pen, so you don’t have advanced features. But you can still scribble on that big 5.7-inch screen. Mondays are special promotion days for Starbucks Rewards members. So much so that has created a Merry Mondays website. For Monday 11/30/15, which coincides with Cyber Monday, if you are a Rewards member, and visit your local store after 2pm local time, and place an order of $15 or higher (in a single transaction), you will earn 8 bonus stars. 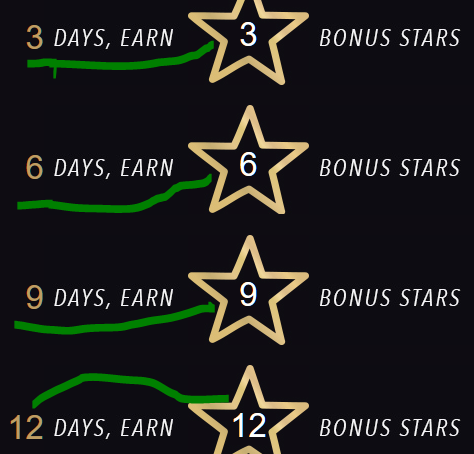 That’s 3/4ths of a rewards, because you will also get the usual 1-star. 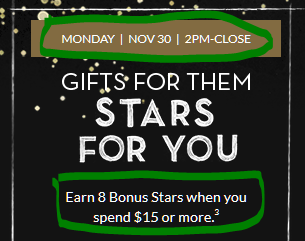 Speaking of Cyber Monday, if you shop at the Starbucks website, spend $60+ and enter coupon code CYBER15, you will receive $25 off your order total. This offer is good for Cyber Monday. Something very exciting is happening this shopping week at Rite Aid stores, running until the close of business on Saturday December 5 in 2015. There is a special on Netflix gift cards! 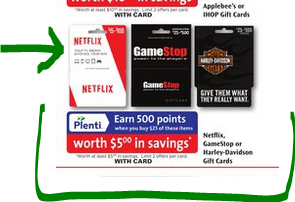 If you purchase $25+ Netflix gift card, you will earn 500 Plenti points which are worth $5 in future purchases. That’s essentially a 20% discount. You can use this to start a new Netflix subscription or add it to your existing subscription. Their payment system will first use the gift card and once that is used up, it will continue charging your credit card. The promotion is limit 2 during this week, which means you pay $50, you add $50 to your Netflix account (that’s around five months if you have the standard streaming plan), and have 1000 Plenti points added to your account and usable the very next day after 6am local time. This is an excellent deal! If you are a fan of space-based scifi television and you haven’t watched Farscape yet, what are you doing? Drop everything and start watching! This was a boldly going TV series that dared to try all kinds of things that were at the time unheard of (I won’t go into spoilers here). Regardless, this is not a movie review blog, so to the sale we go, you can get the complete series on BluRay for $65 at Amazon by Amazon actual with a limit of three per customer. This came out at a time when TV seasons were 20+ episodes long, so the four seasons included here included 88 episodes! (see epguides for breakdown). Note however that this set does not include the mini-series “Peacekeeper Wars” which is sold separately. This mini-series was in a way in compressed form of what would have been the fifth and final season. After you click Continue, the offer is added to your account, and if you look at the “My Account” page with a web browser, this offer shows under the “Rewards” section. It expires by 12/2/15. American Express is continuing their brick and mortar Small Business Saturday (11/28/15 this year), but that’s not all. Now that they launched their new Plenti rewards program, they have also expanded their Shop Small program with a second promotion. If you shop online using the American Express Shop Small portal between 11/27 and 11/30 in 2015, you will earn 500 Plenti points. That’s the equivalent of $5 in redemption money. You obviously need a Plenti rewards account to do this. The online edition features a number of small(er) online vendors, such as Alibris, CafePress, Tanga, HayNeedle, and more. AMEX is able to do this easily because their Plenti rewards program has an online shopping component, similar to the FatWallet cashback program, so they already have the technology to track purchases. This offer is one time use per customer during this promotional period. If you were planning to shop at any of those retailers anyway, this is 500 bonus points! Amazon has dozens of different shopping services. One of them is Prime Pantry, their semi-strange attempt at simulating a Costco-type of a shopping experience online. And now, just in time for the holidays, they have a sale of up to 20% off on on Holiday items at their Pantry Store. As the name suggests, Prime Pantry is only available to Prime members but it has a $6 flat shipping fee for all items that can fit into the single delivery box (the website shows percentages as you add items). If you previously selected slow-shipping for regular Amazon orders, you may have Prime Pantry credits stored in your account (I don’t recall when those expire). Those were $5 credits, so you would sort of be getting free shipping. I guess the best way to find out is to add items to your shopping cart and see your final order total (before the last step that finalizes the order). It appears Amazon wants its Prime members to smell good, because they are offering this 3.4oz Nautica Blue Eau De Toilette Spray for Men for $11, with a limit of five per customer. You must be a Prime member at this point in time, otherwise the shopping cart won’t let you buy it for $11 from Amazon actual. You can always buy it from any of the other sellers that have it over there, but they are more expensive. This particular EDT averages 4.5 out of 5 based on 330+ customer reviews. UPDATE (11/25/15): this is going to drop another $50 for Black Friday, so don’t buy it just yet! ORIGINAL: To encourage more people to jump on the bandwagon during the holiday shopping season, Nvidia is bundling their Shield Android TV device with their own Remote Control for free. So you pay $200 for both. This is the 16GB ShieldTV, not the one with the 500GB hard drive. You can get this offer, with a limit of three per customer, at Amazon. It also has a microSD slot that takes up to 128GB memory cards. The standard Shield kit includes a game controller. The remote is the bonus item here, which goes for $50 on its own. 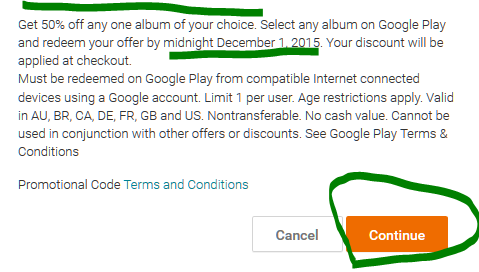 The promotion expires 12/31/15 or earlier if they sell out of them. If you are part of the Virgin Mobile network or if you are looking for a cheap Android phone, the Huawei Union 4G LTE phone, with no contract requirement, is on sale for just $30, in new condition at the Virgin Mobile USA store. This is part of Huawei’s attempt to make progress in the USA market, hot on the heels of their Nexus high-profile selection. It comes with Android 5.1 out of the box, 4.5-inch screen, 1.1 GHz quad-core processor, 1GB RAM, 8GB on-board storage, Bluetooth, and things like that. Check the internets for more specs and reviews on this. No contract, but this is locked to Virgin Mobile, which is part of the Spring 4G LTE network. PS: remember, do not buy any Sprint WiMax phones, sometimes called “Spring 4G” without the LTE part of their name. WiMax is going down. Syfy’s new high profile TV series, “The Expanse”, based on the on-going book series by virtual author James S.A Corey will make its TV debut on December 14, but you don’t have to wait for that long, not only to watch but also own the first episode in HD. It is available (for a limited time) for FREE (as on $0.00 purchase) at Amazon Instant Video and M-Go and Google Play and Vudu. These are commercial-free and you can watch it forever. You can also watch it on YouTube and Hulu and other places but there’s no guarantee it will remain there or that it will be for free in the future, so you are better off scooping it up while it goes for $0.00 at the above streaming services. Season 1 will be composed of 10 episodes. 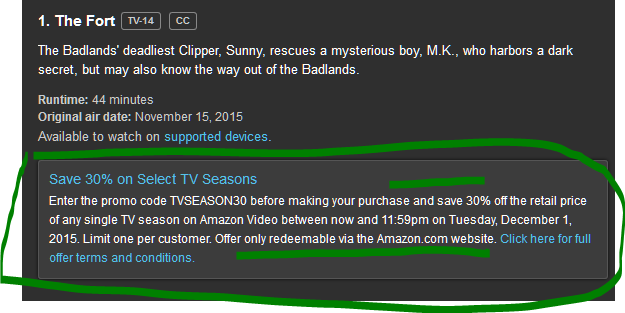 For cordcutters, the Season Pass price is $20 in HD or $15 in SD. This is a complicated TV show, especially if one has not read the the books this is based on, so it’s not a bad idea to watch each episode 2-3 times (with subtitles on) until you become familiar with all the world-buildling and custom language and slang used. If you buy gift cards often and like to shop at Smart and Final, they have a nice combination offer for you running until December 1st. You have to buy $100 or more in select gift cards (eight options) in a single transaction. If you do that, you will receive a coupon for $15 off a future purchase at Smart and Final. 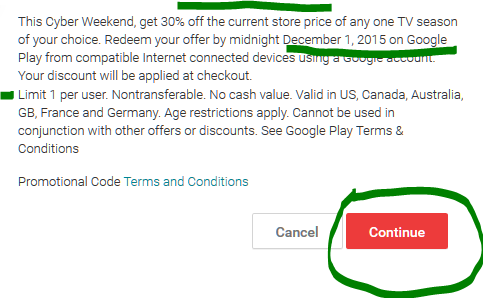 The $15 off coupon must be used by 12/15/15. Limit one $15 off coupon per transaction per customer per day, so you can do it multiple times if you like.